Well, those are called bio balls. 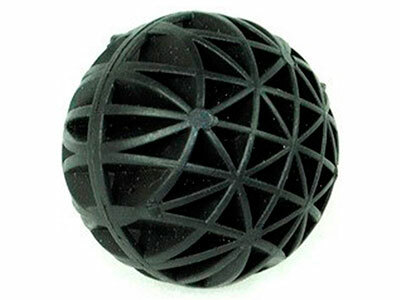 When used properly, bio balls provide powerful biological filtration to your aquarium. Today, I am going to teach you all about them! What are bio balls and what do they do? How do you use bio balls? What is the difference between bio balls and ceramic rings? How many bio balls do you need? What precautions do you need to take when using bio balls? You know those good bacteria in your tank, the ones that convert ammonia into nitrite and then nitrite into nitrate? Yeah, those bacteria form an essential part of the nitrogen cycle. Well, they need a home in your aquarium. Think of bio balls as small plastic houses for nitrifying bacteria. Did you know? Bio balls can be used in both freshwater and saltwater aquariums. 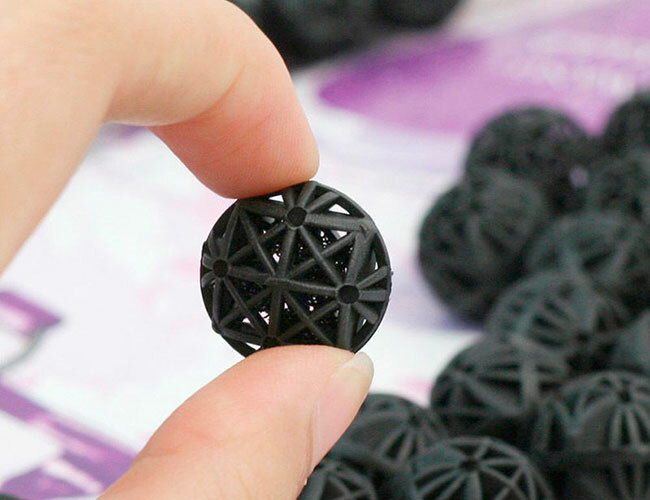 Now, there is no missing the unusual, open-structure pattern that is found on bio balls. But this design isn’t there just to be eye-catching. It actually serves a very important purpose. It increases the surface area of each bio ball. You see, bacteria likes to cling to the surface of objects. And, plastic bio balls have been designed to provide as much surface area as possible for the bacteria to cling to. Even though both of these balls are the exact same size and shape, the bio ball on the left has much more surface area, making it capable of housing more bacteria than the ball on the right. Some bio balls even have small pieces of ceramic or foam hiding inside – even more surface area for bacteria to cling to. The foam is perfect for growing large colonies of nitrifying bacteria. It’s what makes a sponge filter so good at biological filtration – the process of ammonia and nitrites being converted to nitrates. Bio balls sit in your filter. As water passes over these balls, the nitrifying bacteria filters your water, removing ammonia and nitrites – dramatically improving the water quality. With that said, bio balls are a larger media and will work best in a large sump or external filter. There seems to be some confusion over how to best use bio balls. Bio balls can be submerged underwater! In fact, this is how most of you will use them – in your canister, HOB filter or sump. The only time you wouldn’t place bio balls underwater is if you are using them in a trickle-filter setup. Ideally, you should use some form of mechanical filtration, such as a sponge or filter floss, before the bio balls. I cover the importance of this later in this guide. Which is better, ceramic rings or bio balls? You see, both of these filter media are designed to perform differently. But to properly explain the difference, I need to briefly cover the two types of bacteria that call these two filter media home. 1. Nitrifying bacteria – These bacteria eat ammonia and nitrites. They require oxygen in the water to live. Nitrifying bacteria live on the surface of objects in your aquarium. 2. Denitrifying bacteria – These bacteria eat nitrates. They will only survive if no oxygen is present. Denitrifying bacteria live inside rock, ceramic and other porous materials where no air is present. Bio balls only carry nitrifying bacteria. Ceramic noodles can carry both nitrifying bacteria on the surface and denitrifying bacteria inside. FishLab Tip: You can use more than one type of media in your filter. If you wanted to use bio balls with a different filter media, then go right ahead! That makes ceramic rings the hands down winner since they can carry both types of bacteria. And, in a lot of ways, you are right. I personally use Siporax for that very reason. However, it’s a little more complicated than which filter media can carry more bacteria. You see, ceramic rings increase their surface area through tiny little pores. 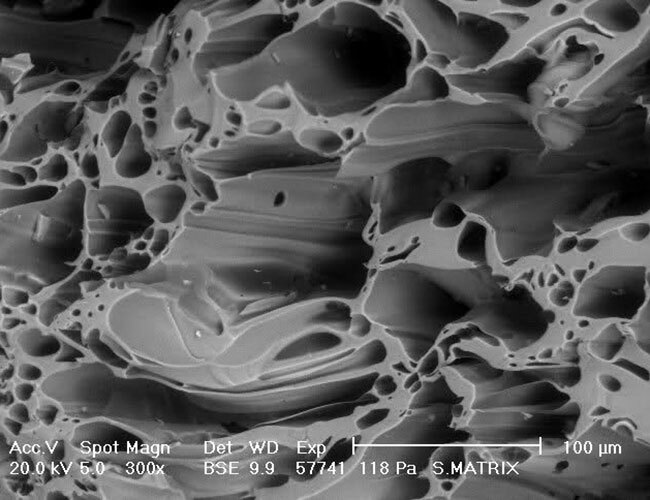 These pores are so small that you can hardly see them without a microscope. It is in these pores that the bacteria make their home. The downside of the small pores is that they can become clogged much easier than bio balls. This is especially true in tanks that don’t have effective mechanical filtration. While cleaning ceramic rings can help increase their lifespan, some of these pores will become permanently blocked over time. And when that happens, the biological filtration becomes less and less effective. There will come a time when you eventually need to replace the ceramic rings in your aquarium. Bio balls, on the other hand, last almost forever. For me, I find that the benefits of ceramic-style media far outweigh that of plastic bio balls, but then I have a very strict maintenance routine. If you are looking for a filter media that only carries nitrifying bacteria and requires little maintenance, then bio balls do have their upsides – particularly if you use a trickle filter. The answer to this question depends entirely on the brand of bio balls you purchase. A general rule of thumb is 2.2 gallons of bio balls per 100 gallons of water. Bio balls are available in a range of sizes to fit different types of filters – you will be able to fit more small bio balls in the same-sized filter than you will large ones. Check the manual that came with your bio balls to find the recommended number of bio balls per gallon of water. While adding fewer bio balls than the instructions recommend results in inadequate filtration, there is no harm in adding more. Now, you may have been warned that bio balls are no good for your aquarium because they can become a nitrite factory. Dead leaves, poop, uneaten fish food and other waste can become trapped in the bio balls’ patterned structure. When this happens, the waste can break down and lead to a spike in nitrate levels. If you are using them incorrectly! Bio balls should be used for biological filtration only. You see, bio balls are designed to house bacteria, not to trap and remove waste from the water column. 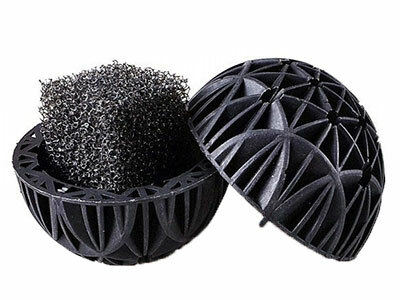 That is the job of mechanical filtration, such as sponge pads, foam blocks or filter floss. A mechanical filter should be in place before the bio balls in your filter system to catch any waste before it reaches your bio balls. With the pre-filter in place, bio balls become an ammonia and nitrite-fighting super team – just don’t forget to clean your mechanical filter every now and then! If you skipped the mechanical filtration, then you might want to examine your bio balls. If you notice a thick green or brown gunk coating your bio balls, then you need to clean them. Cleaning bio balls is best done during a water change. Take some of the water you removed from your tank and swish the bio balls around in it. Don’t scrub or wipe your bio balls as this can remove the bacteria. You should notice the water turn cloudy as the bio balls move through it – this is the built-up organic matter falling off. If your bio balls are particularly dirty, you might need to repeat the process. And, it should go without saying, but don’t use any soap, disinfectant or other cleaning agent – you will kill all the bacteria on your bio balls. As you see, when used effectively, bio balls can provide an amazing source of biological filtration. However, I personally still recommend choosing ceramic noodles or a similar filter media such as Siporax because they can also carry bacteria that removes nitrates from the water – something that isn’t possible with bio balls alone. Do you use bio balls in your aquarium? Let me know in the comments below! So I am planning on using acarum sponge on top then a mix of ceramic rings and bio balls for a 55 gallon fresh water fancy goldfis tank. Do you thing this is a good plan? If this is for a hobby aquarium, I’d just use the ceramic rings. There isn’t really an advantage to mixing biomedia here. Whats your thoughts on alfagrog? I ran into alfagrog when I was visiting the UK. I was curious about it, but when I returned to the USA I discovered it’s basically impossible to come over here, so I haven’t had the opportunity to play with it. So I stumbled across your page googling info on Bioballs. You were very informative and now I know that they can be submerged. I have a question about the ceramic noodles. When they’ve become “permanently” clogged would a muricatic acid bath not restore their porosity? I can’t answer your exact question. I have no experience restoring Ceramic rings (noodles). Thinking on it, I don’t know anyone in the hobby who even bothers. If you are using mechanical filtration (Coarse + Fine) prior on the filter line, ceramic rings will last years. An occasional, gentle rinse, in fresh water if things look bad will will get them good again. Going further, any ceramic rings that are made from fired clay will eventually begin to dissolve anyway, although this process can take many years. Add the fact that ceramic rings are very affordable, you fully stock most filters for less than $10 and there is honestly little reason to restore them. Involves two steps with two bacteria groups. – Most Nitrate generation in our ecosystem is assimilated by plants in their biological processes. Plus plants can offer much larger surface area for denitrification especially aquatic types. – There are bacteria that process Nitrates (eg Pseudomonas, Clostridium), but many species are pathogenic to humans and plants. Note: Unlike some Anaerobic bacteria that still perform their processes in the presence of Oxygen, Nitrite consuming bacteria (Nitrobacter) ONLY function in an Anaerobic environment. Also they must be devoid of organic material as it will supplant the Nitrite consumption. Thanks for adding this extra information. I’m sure readers will find it incredibly useful! Could ceramic rings be buried under gravel in freshwater aquarium and work? If by “work” you mean replace your filter. Then no. You are essentially cutting off oxygen and water flow to the biomedia, which means the aerobic bacteria won’t be able to do their job. Surely Nitrifying bacteria – eat ammonia and convert it to nitrites. They don’t eat nitrites. The Denitrifying bacteria – These bacteria eat nitrites and convert them nitrates. Sorry, but what you have said here is completely incorrect from a scientific standpoint. There isn’t much more that needs to be elaborated on. The user above is arguing the definition of something that has already been defined by science. Nitrifying bacteria is a group of organisms that oxidizes (“eats”) both nitrite and ammonia. 1. I understand, only nitrifying bacteria can make their colony in bioballs and nitrifying bacteria work only presence of Air /oxygen . Does it mean that bioballs with nitrifying bacteria needs direct aeration all the time to get direct touch of air /air bubbles ? OR they can use the oxygen dissolved in water? 2. Ceramic ring can hold both nitrifying and de-nitrifying bacteria. But we know nitrifying bacteria work with oxygen, BUT, de-nitrifying bacteria does work without oxygen. My question is how both of them work at same time at same place at same environment? 3. We know, de-nitrifying bacteria work in oxygen less environment and de-nitrifying bio media have to keep in a hidden place where there is no aeration / oxygenation, But water has dissolved oxygen, so how they works with dissolved oxygen in water ? Kindly reply my questions . I am eagerly waiting to learn it. 1. Aerobic bacteria in aquariums used dissolved oxygen to break down ammonia and nitrite. 2. If you were to look at your ceramic media under a microscope, you would see that there are gaps between the aerobic bacteria, allowing nitrate to reach anaerobic bacteria. It is worth mentioning that you would need an impossibly large filter with ceramic rings to effectively filter nitrate out of a tank as quickly as it is produced. 3. Because ceramic rings are porous, the de-nitrifying bacteria can work their way DEEP inside the media. Under ordinary filter flow, dissolved oxygen cannot reach them. It’s like how live rock works in a saltwater aquarium. This is based on my own understanding of the topic. I hope it helps! What can you tell about water speed running through media filter? Rule of thumb, fast enough for your tank size to run through the filter four times in an hour. So if you have a 20 gallon tank, you would want the filter to turn over 80 gallons of water in an hour. 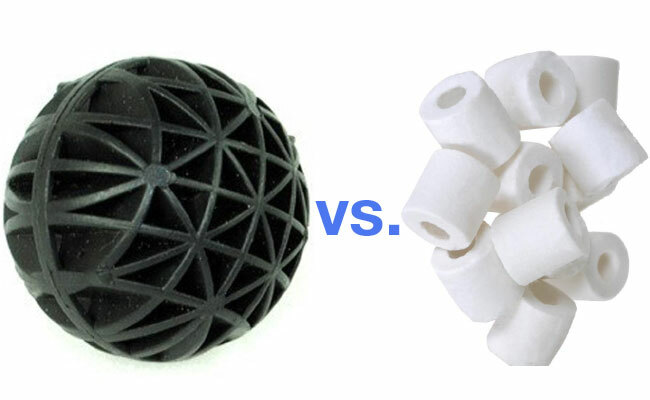 Seachem Matrix vs bio balls or rings for a salt water cannister filter? From your previous responses i would assume ceramic rings? For saltwater, biomedia is not exactly essential – live rock is used as a home for bacteria instead. And it’s far superior to anything you’ll put inside your filter. thank you for this article, if running a saltwater fish only tank, and copper will be used most of the time, in the sump would you still recommend choosing the ceramic noodles over the bio balls ? It shouldn’t make a difference which filter media you use, the results will be the same. Copper can kill off beneficial bacteria regardless of what media you use. I’m trying to find a video recording somewhere that will explain exactly the way of set up but I can’t find it anywhere so I thought to drop a message here. This way the mechanical filtration will trap debris floating in the water, meaning you won’t have to clean your filter floss or biomedia as regularly. Are there any. Bio balls that sink. I don’t want the ones that float. All bioballs I have come across have been lightweight and float around in water movement. 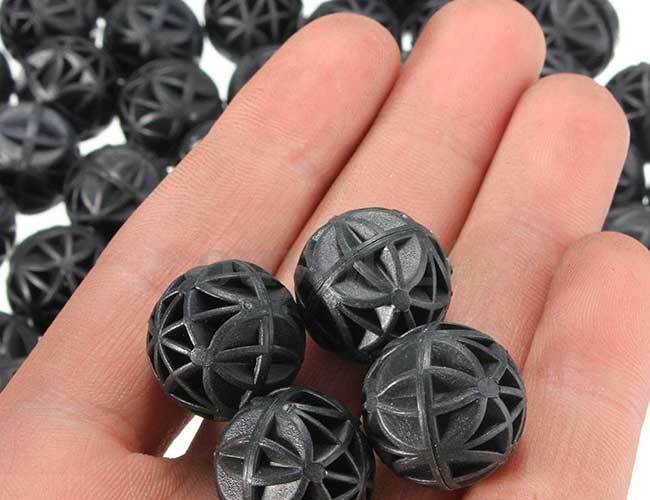 Some of the ones that have sponge inside can be opened, you could try adding a weight to the middle of these bioballs – it would be time consuming, but it’s a possible solution. Thanks so much for the quick reply.. I’ll keep looking for sinking bio media. Not a problem Jim, Although I did think of an alternative solution – throw them in a filter media bag? With all of them contained together, they will sink under their own weight. Ceramic rings are another biomedia that will sink. Do you have any information regarding the bio-balls shown in you article, how many gallons of water can be handled by a piece of bio-ball? If you don’t, any approximation according to your experience? Denitrifying bacteria will thrive when no oxygen is present. Yet, water is partly comprised of oxygen. I’m confused. Excellent question. These bacteria live deep in the pores of filter media, like ceramic rings, where there is little to no water movement. Without water movement, there is not a fresh supply of oxygenated water reaching these bacteria and, in the absence of oxygen, these bacteria then feed off nitrogen. Nitrfying bacteria, on the other hand live on the outside of this filter media and use the oxygen to convert ammonia to nitrite and nitrite to nitrate. Hi, very helpful. I use balls and noodles, but also several layers of coarse sponge, which I think should be similar in effect to the balls. I have also started using bags of small, porous lava rock, available at Home Depot, Lowe’s, etc. It is cheaper than noodles, but supports anaerobic bacteria according to some internet articles. I stock my tanks and refugia with moss and don’t use any chemical filters. My ammonia and nitrites are zero. My nitrates are acceptable. I have to correct pH occasionally. I also use a polishing filter (a heavy felt) and occasional UV for water clarity. From this article I learned that ceramic rings can house Nitrifying and Denitrifying bacteria. in my case, as Mark says in his August 13th,2018 comment, I also use bio-balls, with a thick layer of Seachem Matrix and lava rocks to house the good bacteria plus a layer of coarse sponge and filter floss to keep dirt off them, no chemical, in a total of three filters due to my over crowed discus tank (guilty) with plants. And as Mark’s tank, so far, readings are zero. Now I really want to know what Mark and I doing is too much? If you have your own system and it works, then you are not doing too much. You can never have too much biological filter media. The fact that you have an overcrowded tank with zero ammonia and nitrite spikes is a testament to what a good job you are doing. However, to a beginner starting off, it’s easier and cheaper to get by with a mechanical filter (sponge) and single biomedia (usually ceramic rings) and a correctly stocked tank. That isn’t to say what you are doing is wrong, it isn’t. It’s just a different approach. That’s what makes this hobby so much fun, there is freedom to experiment! I am brand new to all this information. I have two Betta fish in two 5.5 gallons with hang on the back filters. One i have had for 2 years and the other Betta I got about 3 weeks ago. I’m not a big fan of the filtration the filters come with and wanted to customize. I bought ceramic rings, bio balls, and extra sponges. What do you suggest I do from here? I need some guidance. I find a lot of this info on filtration very confusing and just need to hammer down and research. Bioballs and ceramic rings do the same thing – provide your beneficial bacteria with a place to live. If the water quality in your tank is normal (check with a good aquarium test kit), then your filter media is doing it’s job. Can i use both of them, bioball and ceramic ring in my sump tank? Excellent question. I see no reason why you couldn’t! I want to set up one in my fish farm. Please I need your assistance,thanks. You would need to speak to someone with knowledge about using bio balls for commercial applications, such as farming fish.